“Daily Scrum” is a meeting held each day of a sprint , followed by organisations who have adopted Scrum. These meetings are usually held in the same location and at the same time each day. Daily Scrum meetings are mostly conducted in the morning so that it helps in establishing the context for the day’s work. However when you are working in a globally distributed organisation , it can done during a common time agreed team members Daily Scrum meeting is always time-boxed to 15 minutes to keep the discussion brief and important. Allows for corrections in the sprint. It is mandatory for all team members to attend the daily scrum meetings. 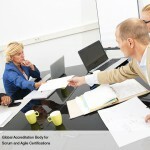 The product owner and Scrum Master are expected to attend and participate in these meetings. 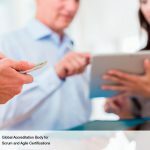 The ScrumMaster is required to only capture the issues recognized in a daily Scrum, and not to discuss or resolve them in the meeting. This meeting is considered to be a “work-centric” feedback circle that team members use to communicate and evaluate progress, identify impediments. 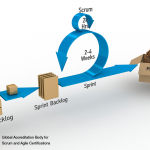 The daily scrum is not intended as management reporting mechanism or status report. Practising daily scrum highlights commitment and liability in the team. These meetings are run by the team, for the team. These meetings help the team to be focused on the goal and also helps in self –organisation and collaboration. The time spent in these meetings can be considered as time well spent when the final output of the project is realised. The daily scrum meetings doesn’t necessarily is not for problem solving or to resolve issues. The daily scrum meeting is not used as a problem-solving or issue resolution meeting. What did team member do yesterday? What is planned to be done today? What are the issues have you faced so far? These meetings help the team to realise what each person has done yesterday and what has been planned to accomplish today. 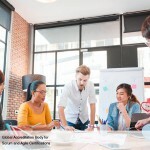 The Every day Scrum assists to improve the individual’s commitment within the team. It creates a self organized team with positive team ambiance.